Spectrum Gallery and Artisans Store in Centerbrook, CT presents its newest show: Myths, Fairy Tales and Fantasies! Original artwork and fine crafts that explore timeless fairy tales, myths and age-old stories that excite the imagination and can be passed down from generation to generation. The exhibit opens Friday, Nov 16 with a reception with food, wine and the display of Spectrum’s annual Holiday Tree adorned with ornaments by local artisans. The Reception also includes entertainment by storyteller Sujata Srinivasan who will share Indian tales while accompanied by a drummer. 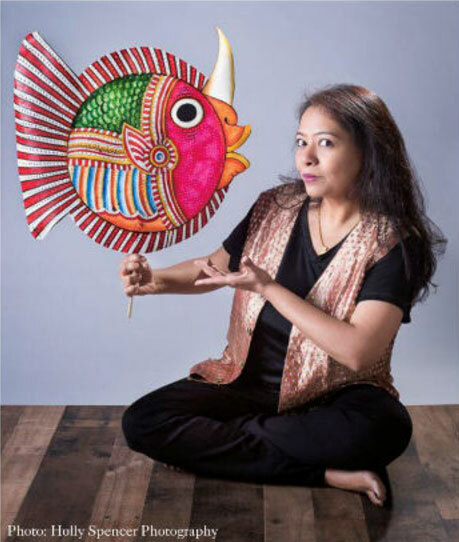 Sujata is an award-winning journalist who has been telling stories for children and adults for many years. A classically trained dancer in the South Indian art form, Bharatanatyam, her performances contain music, dance, art, and costume. At Spectrum she will perform two myths from Hindu mythology: the emergence of Lakshmi, goddess of all graces from the milky ocean; and Mohini, a disguise adapted by the Hindu deity Vishnu to rid the Earth of the demon Bhasmasura. Spectrum Gallery and Store holiday hours are Wed-Sat (Noon-6pm); and Sun (Noon-5pm). Beginning Sat, Dec 8 through Dec 23, Spectrum is open Mon-Sat (12-6pm); Sun (12-5pm). Christmas Eve open 11am-3pm. For more information call (860) 767-0742.